By default, many people consider pistols and revolvers as primary self and home-defense weapons, while the shoulder arms get put in hunting and sports category. If you belong to that group and rely on handguns for your and your family members’ safety, you should have a pistol locked away in a safe, because having guns lying around your home isn't safe. In general, gun safes are protective storage containers that will primarily prevent access by unqualified and unauthorized people but will also protect its contents from damage during a fire, flood, or any natural disaster. 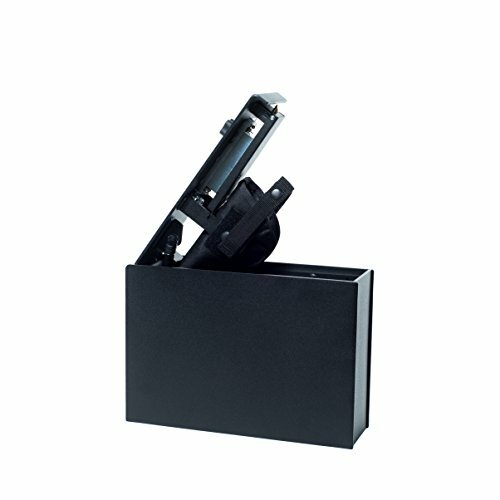 While most gun safes are multipurpose, and you can adequately store your Glocks or S&W in larger safes made for rifles or in smaller safes, customized for handguns, in this guide we review a particular type of handgun safe purpose-built for quick access in home protection scenarios. Why Do I Need A Handgun Safe? It is a fact that firearms, and especially handguns, are a favorite among thieves, so the majority of the states in the USA require you to lock your weapon in a safe place. If you are a responsible firearms owner, it is mandatory for you to find the best safe to keep your handgun secure taking into account preferences and your budget. Here, we will discuss several reasons to own a handgun safe. The best solution for keeping your firearms secure and accessible is to procure two safes. One is for larger, long-barreled guns and those weapons that aren’t being used frequently and another small, handgun lockbox that you can keep hidden in your home to give you the ability to access it quickly. First, the handgun safe has to protect your pistol or revolver from theft. It must also keep your guns out of the hands of children or any other unauthorized person. If you buy a gun safe with good fire rating, it will protect your guns from damage in the event of a fire. Rapid gun deployment is another highlight. With a smart choice of the low profile unit, you get a small quick-access bedside gun safe for home protection. Finally, due to the laws in some states, which requires the possession of a safe or lockbox, you will avoid the lawsuits in case of theft and misuse of your handgun. The main reason you’re buying a handgun safe is for rapid deployment of your defensive handgun. Since a gun vault can fit one pistol or revolver and some spare ammo, they are the perfect compact size to be easily placed out of sight but also keep your weapon at your fingertips at any moment. A good handgun safe should come with a sufficiently rugged body and locking mechanism to resist burglar attacks for a specified period of time, as well as to protect its contents from the fire. There are a few different options when it comes to features of a great handgun safe. Most traditional gun safes use a key lock and is a vital reason why most of the modern gun safes on the market still come with a backup lock and key. While these locks are much cheaper than digital electronic keypad locks, they require some extra time to unlock and open the safe. A digital electronic lock is more convenient than the lock and key system and you should look for electronic locks with electronic-mechanical protection (EMP), particularly those electronic locks that are U.L. rated. On the flip side, electronic keypad locks may pose issues with accessing the contents. 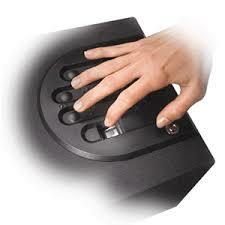 To overcome these issues, the industry developed sophisticated biometric (electronic fingerprint) locks. What could be more natural than these high-tech locks? When quick access to your weapon is a must, the swipe of your finger over the reader is the only thing you have to do to open your handgun safe. While the selection of dials, keypads, and plain-Jane mechanical locks or biometric fingerprints is very important, you have to consider a three-point locking system as a mandatory setup. 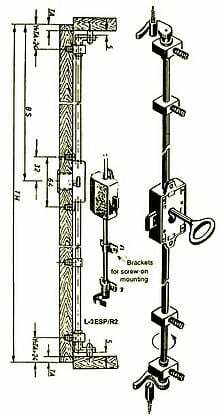 Unlike cheap lockboxes, which use only a single-point locking, a three-point lock uses three horizontal bars that extend into the door on three sides of the safe. As for the appropriate wall thickness, the gold standard for a quick access safe is 10-gauge steel. The “gauge” is a measure of how thick steel used in a safe is and, like shotgun gauges, a smaller numerical number is actually thicker, whereas, with a larger number, you will have thinner steel material.In the table below you can find comprehensive values of gauges, along with fractions of inches and millimeters. Fire ratings with handgun safes are often overlooked in comparison to large gun safes. Generally, most handgun safes are unable to offer fire protection in a reasonable price range, since the heavy steel alone won't be enough to resist fire. If your budget is not limited, you should opt for a safe featuring a concrete lining and a fireproof seal around the inside edges that will expand when exposed to extreme heat. As with all safes, the recommended fire protection should be at least one hour, as certified by U.L. lab fire rating. How Accessible is it When Needed? As a general rule, storing firearms keeps weapons safe from children and intruders, but handgun safes also must provide quick access to your pistol so you can use it in an emergency situation. With many available quick access gun safes on the market, you will be able to find one to fulfill both of these needs. A quick access safe locks your handgun up just like any other safe while using modern, advanced technology to allow the safe to be opened one-handed within seconds. There is no need to sleep with a loaded gun under your pillow since you can now mount a quick access electronic gun safe to your nightstand, along the side of your bed, or under your desk. In many ways, the best place for a handgun safe is a trade-off of convenience, access, and protection. Less convenient locations generally offer more protection; different gun safe locations provide varying levels of protection from moisture, theft, flood, and fire. For example, a safe in the bedroom is an excellent location for quick access and flood risk but is also the most likely target for burglars. Although gun safes may look cool, they are more secure when hidden in a pull out drawer, bolted to the floor under the bed, or mounted to a shelf. A couple of the high-tech advanced electronic safes have dual roles as vehicle safes too, featuring the ability to be chained to the car seat. Determining which risks are most concerning for your situation, you will need to decide on the ideal location for your handgun safe. Here, we put together a guide for the best handgun safes, including all the features a gun owner would appreciate in these types of vaults. 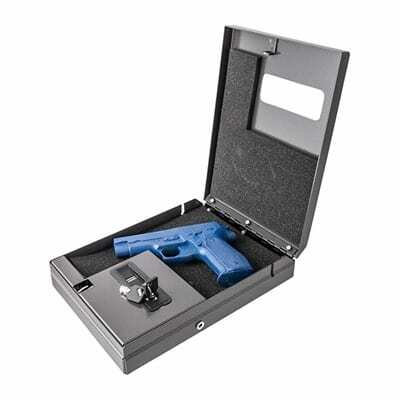 ​From FAS1 Safe, LLC, a manufacturer specializing in handgun storage, we have singled out their FAS1-Magnum S safe. While the original "FAST ACTION SAFE", can accommodate at least one handgun in the holster and one lying on the bottom, the Magnum S model has ample room for three handguns inside, including one placed in a holster and two on each side of the primary gun. Unlike a classic mechanical tumbler lock or keyed safe that takes too long to open during an emergency, a FAS1 mechanical simplex-style lock uses a mechanical push-button lock for reliable operation. After entering the proper combination, twist the knob a 1/4 turn clockwise and the gas spring will automatically open the safe door. Like other FAS1 safes, this larger Magnum safe is constructed of seven-gauge steel plates (3/16") with the door connected via a solid 3/8" hinge pin. ​Although the safe does not have pre-drilled mounting holes, it can be mounted vertically or horizontally by bolting it to the floor or wall. It can also be cabled to the main bed beam or something solid. In addition, the FAS1-Magnum safe can be purchased with an optional keyed lock. The HDX-250 Smart Vault is the middle brother of Liberty`s new Home Defender (HD) family. The 16-gauge steel body, 14-gauge door, and reinforced latch system guarantee resistance to prolonged attacks. 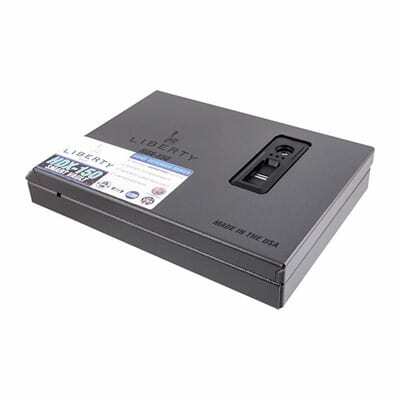 The Liberty HDX-250 Smart Vault, along with solid steel construction combines piston assisted opening, tamper-resistant design, and a lighted interior. This HD quick vault features an auto-opening door that opens on the front side. The heavy-duty steel door is operated by a single 9V battery (included) or the included AC power adapter. This Biometric Smart Vault series offers quick access to your pistol with the swipe of your finger. 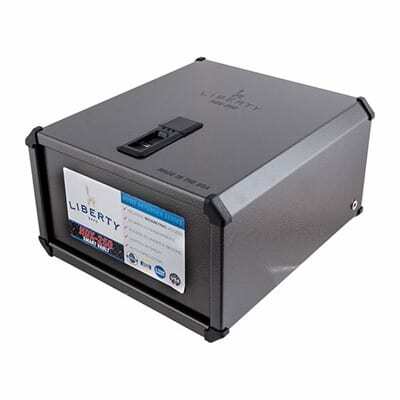 Liberty Safe is a well-established company that builds a quality product and their HDX fingerprint firearm vaults have the lowest fail-safe rate on the market. The HDX-250 boasts a 15 fingerprint memory storage and, like the majority of handgun safes, it still features a tubular lock for bypass and comes with two keys. As with the HDX-150 Smart Vault, this big brother has the same issues with a gap surrounding the bypass lock. However, Liberty addressed the security issues by correcting these flaws, resulting in an updated model that is considerably more secure than the initial series. The minimalist design of the Vaultek Slider series and its advanced technology features provide a highly interactive experience for a new generation of gun owners. While you can opt for biometric or non-biometric variants, the Vaultek Slider Safe is one of the sleekest and easiest to use gun vaults. Featuring robust 16-gauge steel construction, it can accommodate only one mid-sized pistol and a spare magazine without extension and nothing more. Its non-absorbent closed cell foam padding tightly fits your Glock or another compact gun. The biometric version can be opened with a fingerprint or choice of Bluetooth phone app, smart key, or standard mechanical key. Due to the precision rail system with ball bearing guides, this vertically oriented safe could be discreetly installed beneath a desk, nightstand, on a bookshelf, or in a vehicle. The kit includes a proprietary mounting plate to allow for a variety of mounting configurations, a rechargeable lithium-ion battery, two spare manual keys, a micro-USB charging cable, an AC power adapter, and mounting hardware. Without a doubt, the slim Vaultek Slider Series are the most efficient safes currently on the market. Using smart, safe technology, which allows you to check battery levels and history log; enables you to uncover tampering attempts and control and monitor the safe from your smartphone. ​Liberty Safe acquired 9G Products in 2014. 9G Products actually produced the HDX-150 Smart Vault and Liberty Safe has taken over production of this handgun safe since that time. The HDX-150 Smart Vault belongs to Liberty`s Home Defender (HD) Series and along with the larger one, allows for quick and secure access by using the 5th Generation biometric fingerprint swipe technology. When using a 9v battery, entry is obtained in 1.63 seconds and with an optional AC Adapter plugged in, you gain access to your pistol in one second. The HDX-150 Smart Vault also sports a biometric reader that can be programmed with up to 15 different fingerprints, for anyone needing to access the safe. This quick access handgun safe is built of heavy-duty 14-gauge steel and boasts a reinforced latch system. While portable and small enough to fit in a nightstand drawer or even in your car, this vault can still accommodate most handgun sizes, plus some other small items. It can be anchored to a solid surface with the included security cable using the provided bolt down holes. ​Whereas the biometric entry system is very reliable, Liberty ships this safe with back up keys. You may have found the original HDX line had a serious design flaw since the framework surrounding the bypass lock had a gap, which allowed unauthorized persons to reach the administration button using common tools. As its name says, Stack-On QAS-1512 safe provides fast access to your defensive firearm, but it also secures your handguns from children while at the same time meeting state regulations. The Stack-On QAS-1512 has an interior volume 0.4 cu. ft. divided into two compartments with an included removable shelf. The foam-padded interior is sufficient to hold most popular handguns ranging in size up to a large frame revolver or full size 1911. 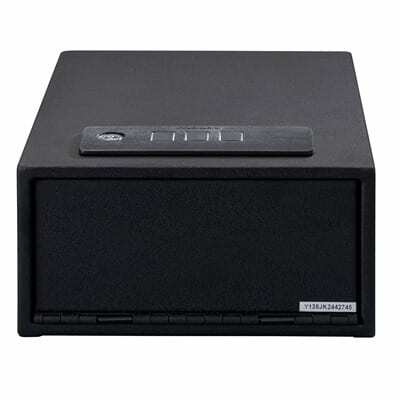 The Stack-On QAS-1512 safe is available with either an electronic or biometric lock. 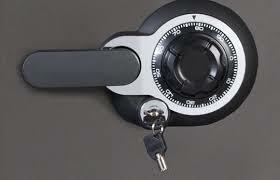 The electronic lock is powered with four AA batteries and stores a 3-8 digit combination. 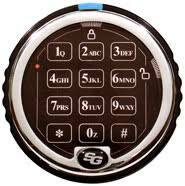 When the correct code is entered on the back-lit keypad, the door opens automatically in about 1.5-2 seconds. In case you forget your combination, the manufacturer has provided backup keys. The package includes fastening hardware and comes with pre-drilled holes for mounting to the floor, wall, or a permanent shelf. 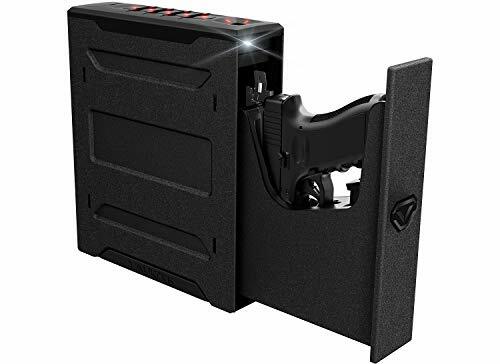 While boxes of this class cannot completely secure firearms from thieves, its design is to keep guns out of hands of children and give you quick access when you need it. ​Handguns safes are a specific type of safe intended to be the last line of defense against unauthorized access to your firearms while providing you the ability to access your weapon quickly. Featuring a tamper-resistant design, handgun safes have to provide a minimum level of protection to stop unwanted handlers in a short period of time. If you are in doubt of the right choice for you, then you need to follow the golden rule that safes should cost between 10-30% of the value of your firearm collection. Ultimately, think of your safe as an investment, and something you can pass on to the next generation.